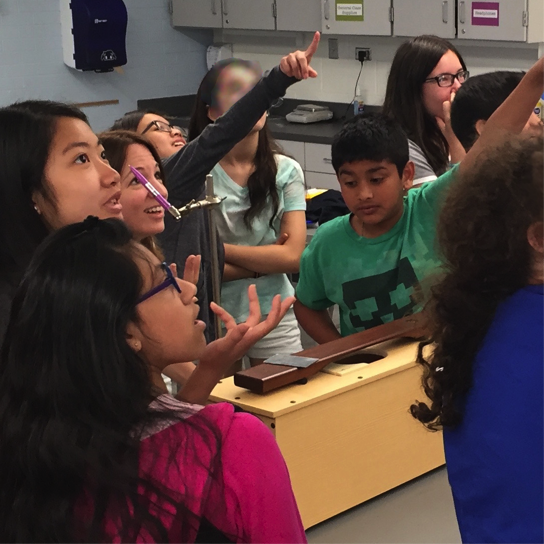 In this unit, students start by observing a perplexing phenomenon. When a sewing needle taped to a cone is dragged over the surface of a plastic disc that is spun underneath it, it produces voices and musical notes. This leads students to start wondering about other sound-related phenomena, which in turn leads to wealth of new questions about 1) What causes different sounds? 2) What is traveling from a sound source to our ears? 3) How do we hear and why do we hear things differently in different places? and 4) How do electronic devices (digital sound sources) produce and detect sounds? 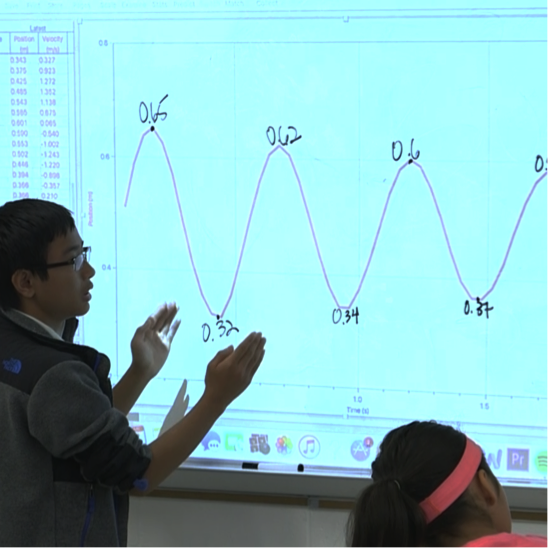 By investigating concepts like loudness and pitch, students learn how to model vibrations to convey important ideas about changes in the frequency and amplitude of vibrations that can explain different characteristics of sounds. What they figure out from this helps to answer their initial questions about what causes different sounds. 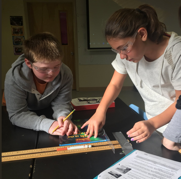 By testing various types of materials and using varying simulations, students figure out how sound travels from one location to another through matter. What they figure out from this helps answer their initial questions about what travels from a sound source to our ears. 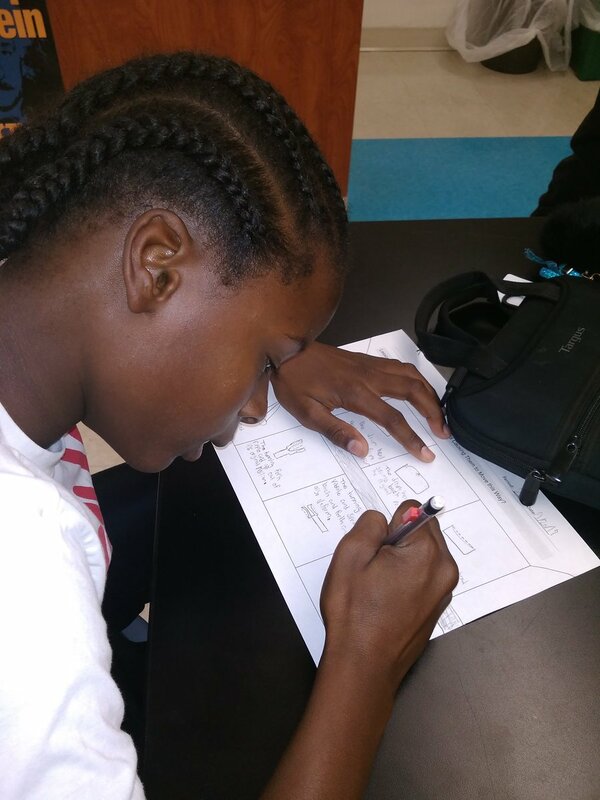 By investigating the internal structure of the ear and testing how different structures can redirect sounds, students figure out how sounds can be detected, reflected, absorbed, and transmitted. What they figure out from this helps answer their initial questions about how we hear and why we hear things differently in different places. By dissecting an electronic speaker, building and testing a speaker of their own design, and analyzing how Edison wax cylinders and vinyl records were produced, students figure out how analog and digital audio information can be encoded and played back. What they figure out from this helps answer their initial questions about how electronic devices (digital sound sources) produce and detect sounds. Brian Aycock currently serves as the Third Grade Curriculum Coordinator for West Aurora SD 129. He is also the Elementary Director for the Illinois Science Teachers' Association. He is passionate about science education, and specializes in three-dimensional curriculum development and implementation. He resides in Downers Grove, IL with his wife Samantha, and his two children Brooklyn and Donovan. Lisa Brody is a PAEMST Finalist and Illinois Science Teacher Association recipient and a middle school science teacher. Lisa holds a Bachelor's degree in Education from Indiana University and a Master's degree in Curriculum and Instruction from National-Louis University in Illinois. She has collaborated with leading science education researchers and has provided IQWST (Investigating and Questioning Our World through Science and Technology) workshops to teachers and administrators. Lisa focuses on what is best for her students and how they can propel their own thinking. Tara A. W. McGill is a Curriculum Development Specialist at Northwestern University. Prior to her current position, she taught ninth-grade biology in Chicago Public Schools and developed curriculum materials with Ag in Progress Partnership, NFP. She researched honey bee biology and behavior in the Entomology Department at the University of Illinois-Urbana/Champaign (UIUC). While at UIUC, she also performed informal science outreach and collaborated on several science education projects. 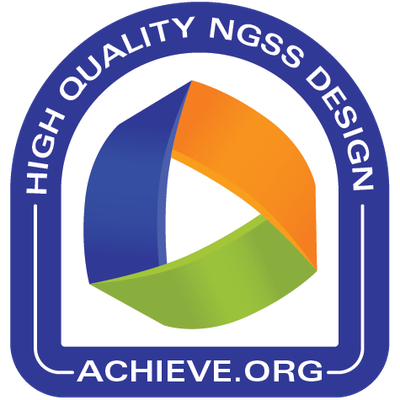 McGill is also a facilitator and member of the design team for the Next Generation Science Exemplar System for Professional Development (NGSX), a web-based professional development system designed to help educators grow in their understanding of three-dimensional learning. 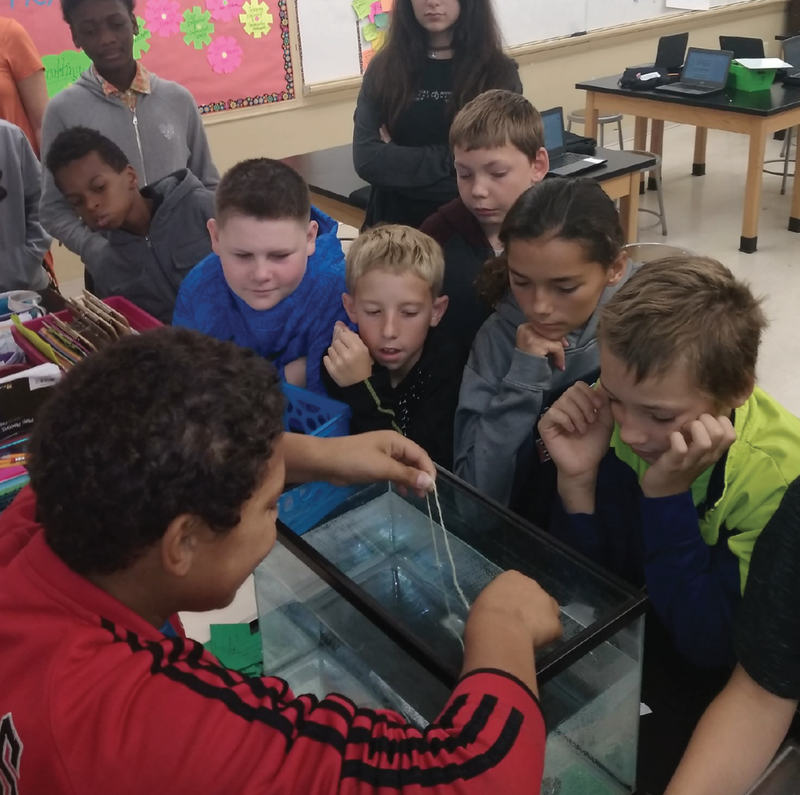 Keetra Tipton is an Illinois Science Teacher Association Outstanding Teacher of Science award recipient, and currently teaches middle school science. She holds a Bachelor’s degree in Zoology from the University of Wisconsin - Madison and a Master’s degree in Secondary Education from DePaul University. 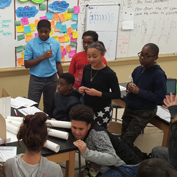 Keetra was a national field trial participant piloting science materials that were developed to help students engage in three-dimensional learning. She has collaborated with leading science education researchers and has provided IQWST (Investigating and Questioning Our World through Science and Technology) workshops to teachers and administrators. 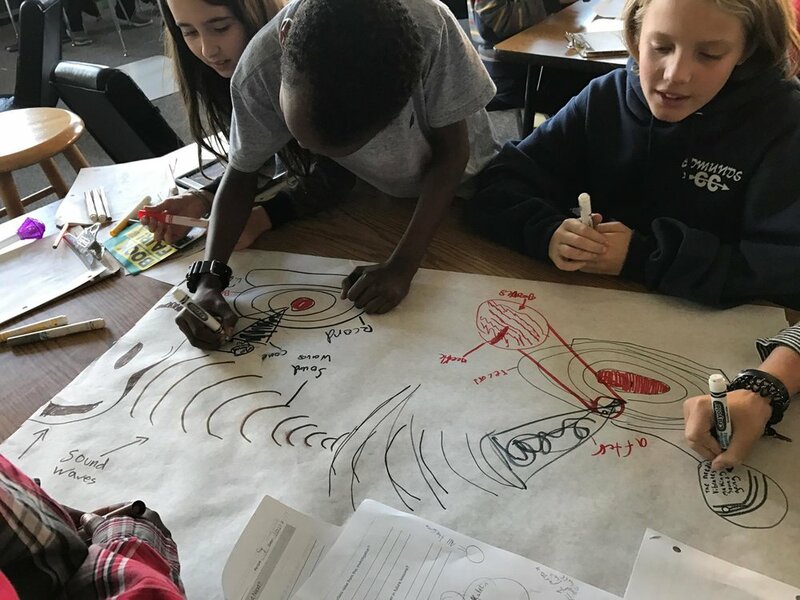 Keetra wholeheartedly believes that all students are able to learn to ask questions and design investigations to answer their own questions about the world. Her passion is coaching them through this process. Meg Van Dyke is a 2014 Golden Apple Fellow, a PAEMST finalist, and has been a middle school science teacher for fifteen years at O’Neill Middle School in Downers Grove, IL. She received her B.S. from Loyola University and her M.A.T from National Louis University. 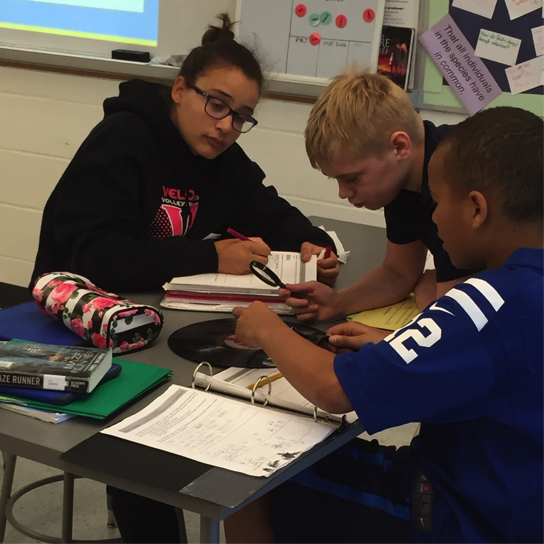 Her interest in technology integration in the science classroom led to her Ed. D. at Northern Illinois University. She continues to research technology use to enhance middle school argumentation.